A few weeks ago (for reasons I’m still unsure of) I decided to buy 1kg of chia seeds. It made sense at the time! So I found myself with a million chia seeds thinking of some exciting things to do with them. My first attempt of making my own chia pudding was a bit of a flop, to say the least. I naively just mixed some seeds with some almond milk and left them overnight to soak. The next morning I excitedly dashed to the fridge to discover that what I had actually made was flavourless frog spawn. So here is my attempt to make something rather more delicious! Once you get the hang of using them, they taste great and are so good for you as they are crammed full of nutrients and antioxidants. It’s nice to be able to enjoy a desert which tastes indulgent but isn’t packed with calories! I picked up a bag of fresh cherries from Portobello market the other day, which inspired this ‘Cherry Bakewell’ themed pudding. 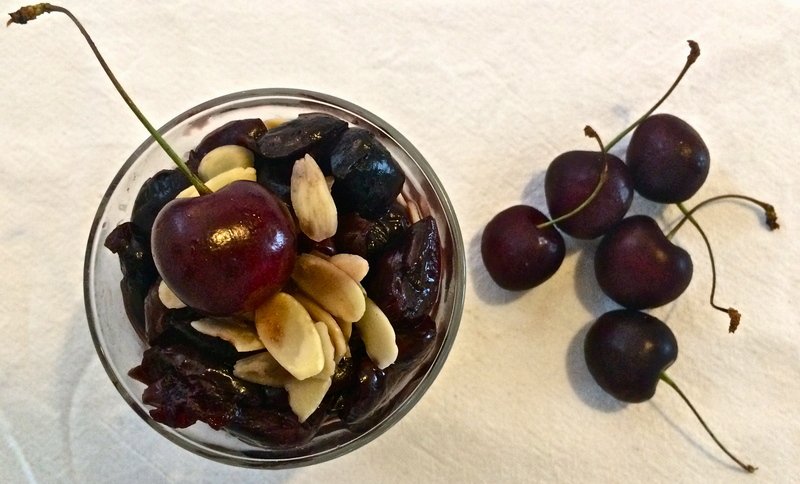 Cherries and almonds are a match made in heaven, and the mild chia seeds carry the flavours really well. 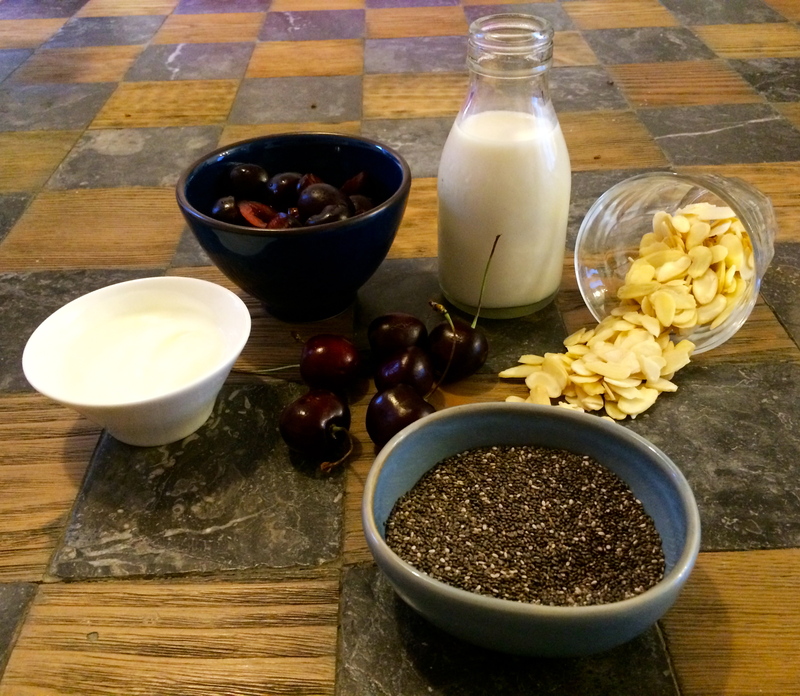 Start by mixing the chia seeds, yoghurt, agave nectar and milk in a jar. You can substitute the agave nectar for another sweetener if you prefer. You will need to leave this for a at least 4 hours for the seeds to absorb the liquid- they become an almost jelly like consistency once they’ve been properly soaked. I find it easier to leave them overnight so that they are good to go the next day. Pop them in the fridge and leave them to work their magic! When you’re ready to assemble your pudding, de-stone the cherries and pop them in a pan with some water and a tablespoon of brown sugar. Leave them to simmer on a low heat until they become a lovely and soft and start to form a syrupy compote. Layer up the chia mix, flaked almonds and cherry compote in a jar, and your pudding is good to go. All that is left to do is tuck in and enjoy your guilt free desert! 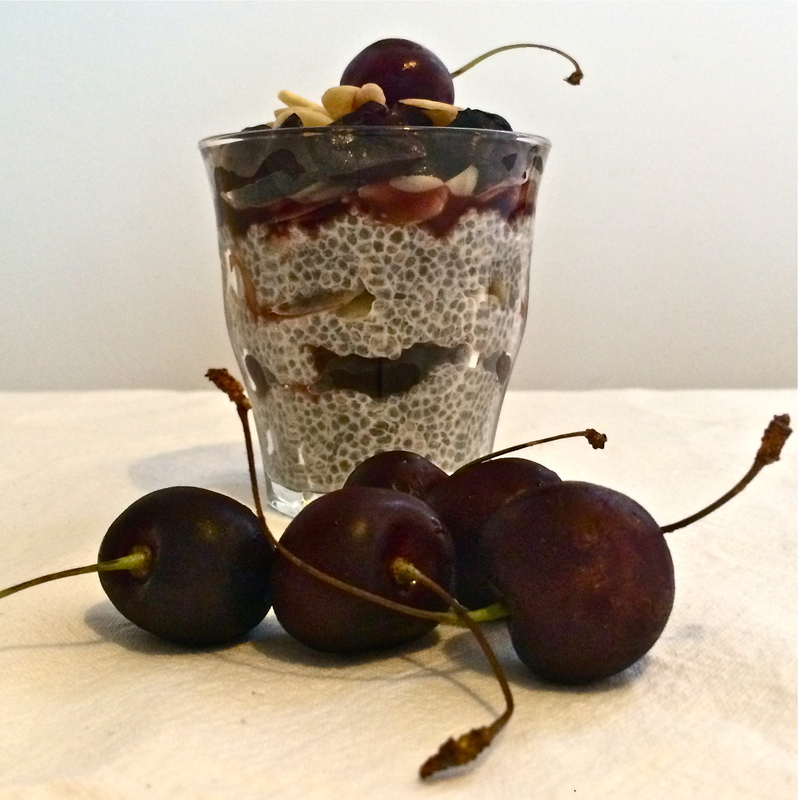 You really can add anything to a chia pudding. The key to making it really tasty is to make sure that you use a mixture of yoghurt and milk, and always add either some nuts or seeds to add a nice crunchy texture. Use whatever fruit is in season or what you have in your fridge! Flavoured yoghurt, especially coconut yoghurt, makes it really tasty too. Give it a try, it’s super easy!